Very comfortable shoe bought (44) for my UK size 8.5 - 9 feet. 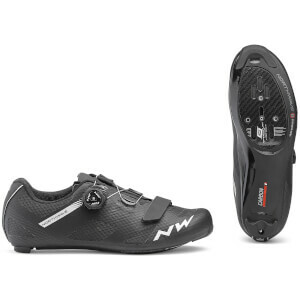 I have always had Northwave carbon road shoes and at this sale price is a very good deal comparing to other brands. 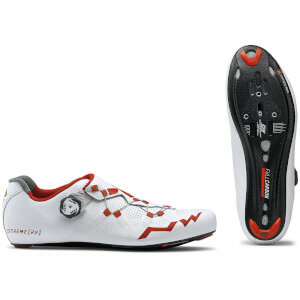 When I test rode them there were no issues with fit, size or comfort. 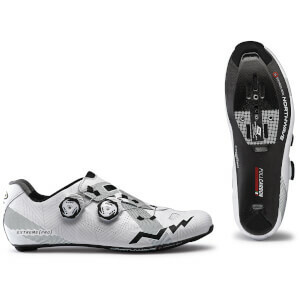 The shoe material is soft and the SLW2 dials are simple to use. Quality on Northwave shoes is excellent, again at this price for a carbon soled road shoe offering great performance is not to be overlooked. 2 reasons why I did not give it top rating, is one the colour, when you look at the images online the white/grey is not light grey at the rear of the shoe (which I prefer) but actually a dark grey, secondly the pull tabs on both shoes where missing - however this is not a problem because loosening the dials is still functional. Overall still an excellent shoe.